The big news to cap off this week will be the jobs report. But there are still plenty of other things going on in the markets. 1. Jobs, jobs, jobs: The U.S. Bureau of Labor Statistics will release the highly-anticipated August jobs report at 8:30 a.m. ET. This is one of the biggest market events of the month because it gives investors deep insight into the health of the U.S. economy. U.S. stock futures were all moving slightly lower. Economists surveyed by CNNMoney project the U.S. economy added 226,000 jobs in August and the unemployment rate edged down to 6.1%. On Thursday, processing firm ADP (ADP) reported that private employers added 204,000 new workers in August. That marks the fifth straight month of companies adding at least 200,000 new hires to their payrolls. 2. Ceasefire or more sanctions? : Investors are also waiting to see whether the U.S. and Europe hit Russia with new sanctions over Ukraine. The crisis has hurt trade and dented business and consumer confidence in the eurozone, snuffing out anemic growth. However, the threat could be suspended if a previously announced ceasefire goes into effect Friday in eastern Ukraine. "A decision on implementing [the new sanctions] will only be taken in light of developments on the ground," said EU spokeswoman Maja Kocijancic. "If there is a ceasefire agreed in Minsk today, member states would look at how serious it was and decide whether to go forward." Major European markets were mixed in early trading after strong gains Thursday inspired by the European Central Bank's dramatic moves to boost the economy. Russian markets were moving sideways. 3. Stock market mover -- El Pollo Loco: Shares of El Pollo Loco (LOCO) rose in extended trading after the company released its first earnings report since it went public in July. The company said sales and profit rose compared to the same time period last year, making investors salivate. 4. Thursday market recap: U.S. stocks closed in the red Thursday. 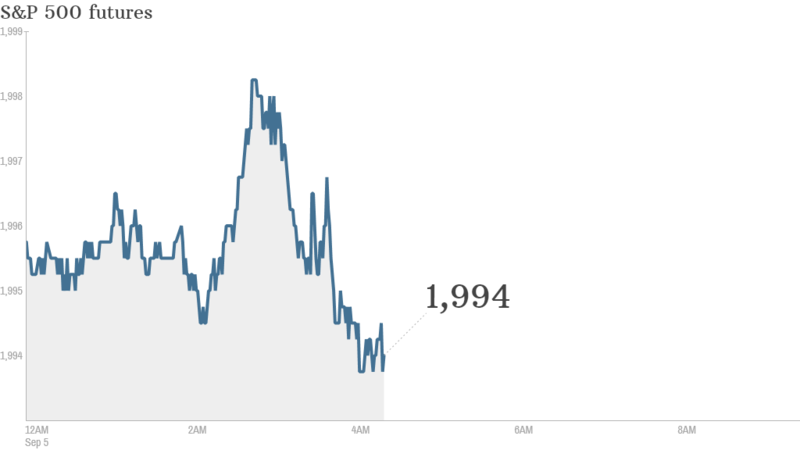 The Dow and S&P 500 both slid about 0.1% while the Nasdaq closed 0.2% lower. The week as a whole has seen relatively uninspiring stock market performance.